UPSC Prelims CSAT 2017 Answer Key will be published here by the Team of GKPlanet soon after the exam is over. In order to publish the reliable and error free Answer Key of UPSC CSAT 2017, gkplanet will be looking various sources Solutions & Cut Off. The UPSC will conduct the Preliminary Exam of 2017 on 18 June 2017 for 980 vacancies(approx.). Answer Key published here will be helpful for the candidates who have appeared in the exam to evaluate themselves and get an idea about the result and cutoff. GKPlanet will be publishing the Answer key of Prelims 2017 and the discussion on the Expected cut off. We will request you to keep watching this space for the UPSC Prelims Answer Key 2017. You can download the Answer Key of UPSC IAS Exam 2017 from the link given below. 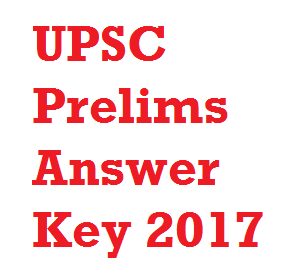 The link will be activated soon after the Answer Key of UPSC Prelims 2017 is published by our Team. From 2011 onwards, the preliminary examination, now popularly known as the Civil Services Aptitude Test (CSAT)(officially it is still called General Studies Paper-1 and Paper-2), intends to focus on analytical abilities and understanding rather than the ability to memorise. The new pattern includes two papers of two hours duration and 200 marks each. Both papers have multiple choice objective type questions only.